Welcome to the Cobblestone Inn & Suites in Oberlin, Kansas. 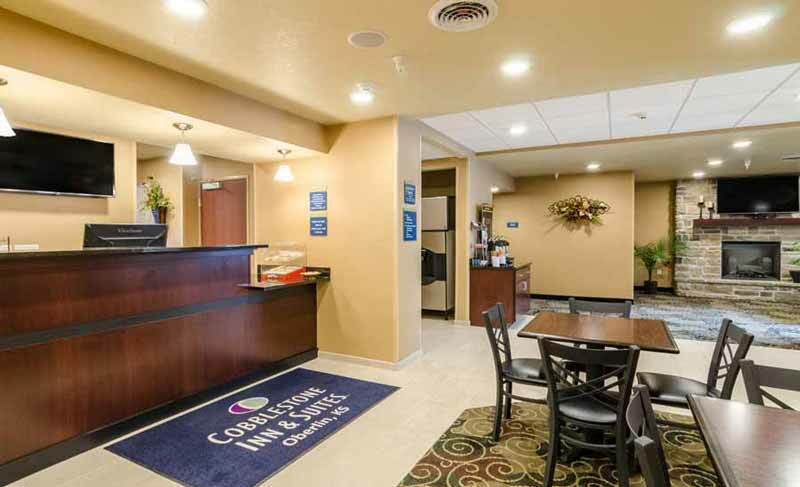 Our beautiful hotel is conveniently located near everything that Oberlin, Kansas has to offer including the Oberlin Municipal Airport, Decatur Health Systems, and more. Our hotel provides easy access for traveling to and from U.S. Highways 83 and 36. Located between Interstates 70 and 80, our hotel is within 250 miles of Denver, Colorado. In town for business? The Cobblestone Inn & Suites of Oberlin, Kansas offers easy access to CHS Inc., Decatur Beef, Oberlin Livestock Auction, and much more! In town for some fun? Check out the Oberlin Country Club, Oberlin Swimming Pool, Decatur County Fair, Oberlin Speedway, Last Indian Raid Museum, Oberlin RC Car Raceway, Sunflower Cinema, The Teller Room Restaurant, and more!